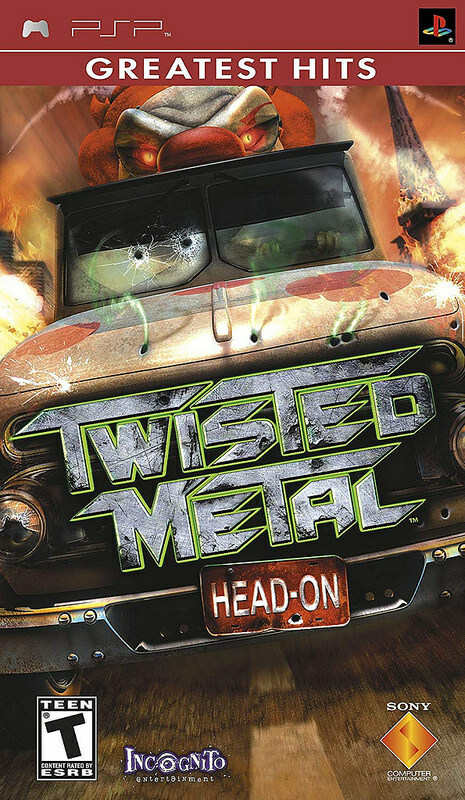 It’s time to look at my first ever Twisted Metal game! It felt good to finally be able to open the door on this franchise. It always looked pretty interesting and who doesn’t like car combat? Naturally the game’s likely a little more limited than the main installments would be, but it gives you a pretty good look at what the franchise is all about. (I assume) There is even a story even if it was rather brief so that’s cool. It’s a fun game and one that you will remember down the line. The game starts with a mysterious being announcing that the entire planet is going to be the battleground for a tournament that he is hosting. The objective is to use your vehicle to destroy everyone else’s. If you are successful then he shall grant you a wish. If you don’t want to participate in the tournament…too bad. Each character gets their own story but at first you only have 2 characters unlocked so I chose the biker dude. He’s not thrilled about this, but if someone’s going to win this thing it may as well be him. There aren’t really any more cutscenes until the end of the game where you fight a giant car that is all but indestructible. Then you are treated to the ending. The guy’s reaction to it wasn’t great though. You get a wish of course, but the main character is just super confused and starts yelling about how this must all be a nightmare. The villain zaps him a bit, but the guy won’t budge so the announcer takes this as his wish and decides to stop with the tournaments for a little while. However, he does say that this is wish that he cannot grant so it was pretty pointless. The main guy should have asked for something a little more valuable. The options are pretty much endless to be honest. When it comes to the gameplay, you’ll likely pick it up very quickly. You drive around in the car and try to blow the others up. You have a machine gun built into the car that you can spam although you have to let it recharge from time to time. It does almost no damage but it’s still good to have. Around the stage there are a few different power ups like Fire missiles, power missiles, upgrades, etc. The best ones are the homing missiles as they deal a lot of damage and are easy to hit with. Most levels will have you try to destroy 4-5 cars. You get 3 lives to do so or you have to restart. I died once, but after that I realized the perfect way to cheese. Look for a health power up somewhere in the level. It’ll keep respawning there so whenever you’re low on health just head for that place. However, the most important thing to do is to grab the upgrades. There are 6 upgrades. I’m not sure if it was a glitch or not, but once I got them all my car became completely invincible. This was really handy for the final boss since I literally couldn’t lose health. Getting the 6 upgrades can be tough because if you lose a life you lose all of your upgrades and earning them back takes a while since you get them only when you destroy cars. Still, it’s worth it and without that invincibility I get the feeling that the final boss would have been a whole lot more challenging. The graphics look pretty good. Naturally I was impressed that it had full voice acting and everything. I shouldn’t be surprised since the PSP always did a good job of feeling like a big console. It’s a shame that it didn’t end up selling better because I do think a lot of passion was put into the PSP. It really could have ended up being one of the big ones and instead it ended up fading into obscurity. The soundtrack is also pretty good for the most part. Naturally there is a lot of rock music which is fun. I can’t really vouch for the lyrical themes because I didn’t understand anything they were saying, but the instrumental themes are definitely quite good. As for replay value, I wouldn’t say that there is a ton here. There is probably a multiplayer mode for if you have two PSPs, but that’s tough to find nowadays. You can try beating the game with everyone to get all of the endings. That will take you around 10 hours I’d say. Beyond that there isn’t much else. If the price was higher then it probably wouldn’t be worth it, but if you can get the game for a few bucks then the initial playthrough probably still justifies the cost. It’s a car game that you’ll want to add to your collection. Overall, Twisted Metal was fun. The plot twist about who the main character at the end was is pretty intense. I’m not sure exactly how straightforward it was though as it’s possible that the guy is actually someone else. I just get the feeling that there is more to the clown than meets the eye, but I really don’t know enough about the franchise to say one way or the other. If you play this game, make sure to keep an eye out for those final cutscenes. They’re pretty fun. With this game completed, I have finally gotten the video game backlog down to 100 games. Definitely a pretty emotional moment. This entry was posted in 7 Star Games, Game Reviews, Games, Reviews and tagged Bumper Cars, Destruction, Game Review, Head On, Playstation, PSP, Racing, Review, Sony, Spinoff, Twisted Metal, Video Game Review by dreager1. Bookmark the permalink.